AHTU – Anti Human Trafficking Unit in the Department of Justice, Irish Parliament. portal would bring to RENATE and all those organisations and groups working to stop human trafficking. Imelda Poole, IBVM, President of RENATE thanked both Aneta Grabowska, RENATE Website Manager and Anne Kelleher, RENATE Communications Person for their work. Board matters such as RENATE Structures, Constitution and Articles of Association were given due consideration, including discussion on the need to ensure East-West balance in terms of representation on the Core Group. Members of the Core Group all agreed to sit for a second term of office (3 years), with the exception of Patricia Mulhall, who steps down at this time from the Board and Core Group. The RENATE Conference to be held in Rome from 6th-12th November, 2016, was discussed. The Theme, Ending Trafficking Begins with YOU was confirmed. Sister Monica Chickwe led the discussions. Amongst the line-up of speakers are: Monsignor Marcelo Sanchez Sorondo, Chancellor of the Pontifical Academy of Sciences and the Pontifical Academy of Social Sciences at the Vatican City; Sr. Gabriella Bottani, Talitha Kum; Ms. Myria Vassiliadou, the EU Anti-Trafficking co-ordinator (via video-conferencing link-up) and Ms. Helena Maleno, specialist and researcher in Trafficking of Human Beings and in Gender Research. Sisters Dagmar Plum and Adina Balan updated the Board regarding arrangements for the next RENATE Training which will take place in Budapest, from the 6th-12thMarch 2016. Sr. Gabriella Legradi is leading the arrangements locally. The Theme for the training is: Advocacy and Campaigning. Sr. Bohdana Bezakova shared her experiences from recent meetings with sisters in the Ukraine and her attempts to establish solid and supportive links with local communities there. [Full report on the RENATE website here: http://www.renate-europe.net/archives/3492]. Bohdana spoke of how the local Greek Catholic communities and the Catholic Church in the UKRAINE are emphasising awareness-raising about human trafficking in order to empower and equip young people who are the most vulnerable. In light of the ongoing war in the region, of particular concern to Bohdana was her observation of the great need for trauma therapy. Patricia Mulhall presented the final draft of the Mapping Exercise across 13 European countries. Everyone congratulated Patricia and all those who contributed to the exercise, which is a unique catalogue of the work that is being done by religious and ngos, including members of RENATE, to prevent human trafficking and exploitation. Practical details regarding the number of copies and dissemination are under way. On one of the evenings after the training, Iva Kúšiková, SSpS, screened the ‘rough cut’ of the film on the work of RENATE. It is hoped that the film will be released early in 2016. A highlight of the week was the visit to Solas Bhríde Centre and Hermitages in the monastic home of St Brigid, Kildare www.solasbhride.ie. 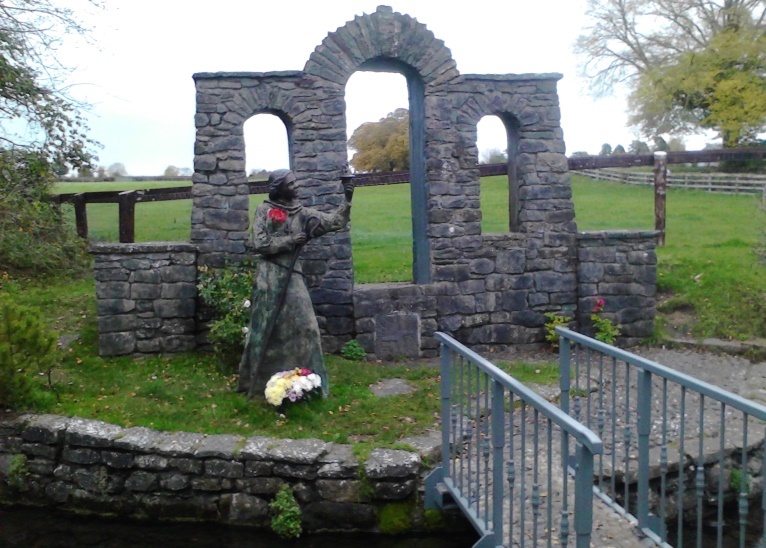 The Brigidine sisters extended their hospitality to RENATE, and afforded the members the opportunity to walk in the footsteps of St. Brigid by leading a mini-pilgrimage to Brigid’s well where prayers were offered for the victims of human trafficking and exploitation. It was a sacred time together. Members arrived at Saturday morning with the feeling that the week had passed by all too quickly and included a tremendous amount of work achieved in a short time.Gratitude was expressed to Mary Mangan, SHJM, for making the arrangements for the week, with the assistance of Eilis Coe, RSC and Patricia Mulhall, CSB and to the members of APT who were at Dublin airport to meet and greet RENATE members.